I know I touched on twin needles briefly in my last post, but I felt like they deserved a bit more elaboration because twin needles are freaking awesome. As I stated before, twin needles are not suitable for sewing seams (too weak, threads show through when you create tension, so sad), but they are absolutely perfect when you need to top stitch knits. My favorite favorite use for twin needles is for the humble hem. True, there are ways to get around hemming a knit - many patterns have you sew an enclosed band at the raw edges so you don't have to fiddle with hems. Also true is that knits don't tend to unravel, so you could theoretically leave the edges raw with no consequences. But sometimes I have a project that would look "off" with a band at the bottom, and I'd like a more professional finish than a raw edge. This is where hemming comes into play. To get a lovely hem edge, a bit of prep work is required. You will want to fold back your hem and press and you normally would with a woven, giving a generous hem allowance - too small, and the hem won't sit nicely after repeated washings (not to mention the throat plate trying to eat it when you try to sew it, yep, that's totally a thing). I've found that 1.5cm//5/8in is a good middle ground - wide enough to appease the sewing machine gods, narrow enough to where it mimics ready to wear. When you sew, make sure that there is enough of a seam allowance so the stitching isn't right by the folded edge - personally, I am most comfortable with 1 1/4cm//1/2in. This exactly catches the seam allowance I've pressed back, and allows enough extra space beyond the stitching so the hem isn't crushed the first time I wash it. The only issue you may have with sewing twin needles is that the right side of the fabric must be facing up (since the underside will get that zigzag stitch from the bobbin). When I was first experimenting with twin needles, I found this difficult since you can't really see what's going on with the underside - and thus, occasionally you'll miss part of the fold and have to redo the hem. Pressing the seam with an even seam allowance solves a lot of that. Another thing that really helps is just feeling the edge with your fingers as you feed it through the machine - even with super thin fabrics, you can feel the difference between a single and a double layer. As long as you catch both layers with at least one of the two needles, you're golden. Here's an extreme close-up, so you can clearly see the straight top stitching (red) and the zig-zag bobbin (white). I've found that for hemming, it really helps to wind your bobbin with wooly nylon thread. It's thinner than regular thread (to the point of being wispy) and has a natural stretch that is great for this type of stitch. 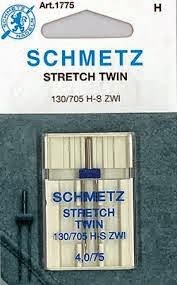 As with hemming, twin needles are also good for attaching things to your knit garments- think pockets and zippers, things that don't get a lot of stress with day to day wear. It stretches more than a single straight stitch, and looks a bit nicer than a random zigzag stitch. Another technique I find the twin needle useful for is top stitching my knit bands (you know... when I'm not creating twin needle hems ;)). Kind of embarrassing, but this was something I noticed on ready-to-wear when I was staring at one of my boyfriend's tshirt necklines in the middle of an argument! Ha! I'm sure manufacturers use a coverstitch machine, but a twin needle creates the same look without needing a special machine. Obviously, you don't have to do this, but it does look nice - and it can be helpful if you sew in a band that that's a little loose, since the stitching helps it sit in place properly. I generally prefer to sew with a needle/stitch on either side of the seam, but sewing outside the seam (on the garment, not the band) also looks nice. Have you ever sewn with a twin needle? What is your favorite technique for hemming and top stitching knit fabrics?